According to Murphy’s law, whatever can go wrong will, and this definitely applies to those ever-important household appliances. 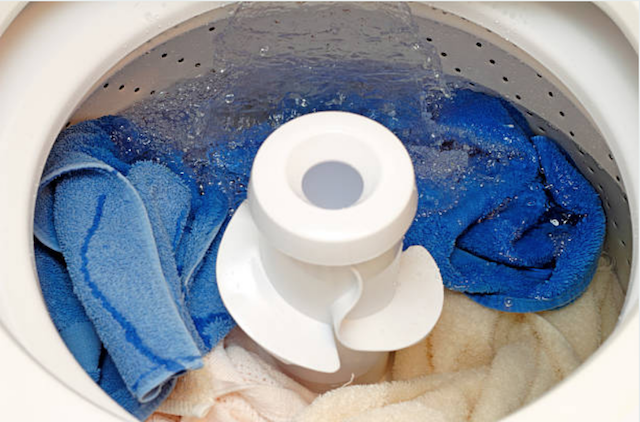 One of the things that can go wrong is that your washing machine won’t drain. This can happen for a few different reasons such as a clog of lint or fibers, a kink in the drain hose, or a piece of clothing that made its’ way into the drain pipe. “If this happens, the first problem that you are going to face is how to get all the water out of it so that you can deal with the problem,” says Tim Nelson, owner of Elite Bloomington Appliance Repair. You may, at first, think that the only way to get this done is to use a bucket and bail out the water. This is the hard way. There is a much better way to handle this issue and we have outlined the steps to help you out. Like when you do any repairs or maintenance, you need to make sure that the power is off. Make sure that you switch the power off (if there is an off switch on your machine) and unplug it. Tape the cord to the top of the machine so that you don’t risk getting it wet when you are taking the water out. There are usually three different hoses in the back of the machine. There are the hot and cold-water hoses that are normally color coded red and blue, respectively. The drain hose is normally the gray one among the three. You are going to need to pull the machine away from the wall in order to easily access the drain hose. There are two possible ways that your machine is going to drain; into a drainpipe in the wall or into a utility sink near the machine. You will need to disconnect the draining end of the pipe from wherever it drains by wiggling it free. You will need to hold it up until you are ready to drain it. If you let the end of the drain hose fall below the water level in the machine, gravity is going to cause it to drain out before you are ready for it. Then you will have a big mess to clean up. You are going to need to pause the draining process every time that your bucket fills up. You will just need to reconnect the drain pipe into where it is normally meant to drain. Keep doing this until all of the water is drained out of the machine. As the water level gets lower in the machine, you will need to hold the hose lower and lower for gravity to drain the water out. As you are draining the machine, you may realize that the water is trickling out much slower than it should. This is a good indication that there is a clog in the drain hose. A plumber’s snake is going to easily take care of this for you. To use the plumber’s snake, you will insert the end of the coil until it reaches wherever the blockage may be and then turn the handles on the other end of the snake. This will release the clog. Be ready for water to rush out as soon as this clog is removed. You may discover that there is no blockage in the drain hose, which means that it is likely in the drain pump. Drain pumps are located in different areas on different machines and you will need to reference your owner’s manual to know where it is and the safest way to get to it. After locating the pump, you’ll see that there are a drain hose and an inlet hose that are connected to it. You will release these hoses by taking off the spring clamps that hold them on with a pair of pliers. Then you can locate where the clog is and remove it with a pair of needle nose pliers and then reconnect everything as it was.